Provo • Before every practice, team meeting, get-together or match, every member of BYU’s women’s volleyball team gathers for a big cheer. Then, every person gives a high-five to every other person there. “We read somewhere that it helps build chemistry, and releases good energy,” said superstar outside hitter Roni Jones-Perry, a national player of the year candidate. Whatever the case, it is working. Heading into the final three West Coast Conference matches of the season, the Cougars (25-0) are the only undefeated team in the country and have been ranked No. 1 in the AVCA poll for 10 straight weeks. Last week, the NCAA volleyball committee revealed its top 10 teams for the tournament based on the criteria is uses to select the field, sort of like what the College Football Playoff committee does, and BYU was No. 1, followed by Stanford, Minnesota and Illinois. That was seen as a huge vote of confidence for the Cougars, whose RPI has gradually fallen once WCC play began. For instance, despite sweeping Santa Clara and San Francisco last weekend, BYU’s RPI dropped from three to five. The top four teams host the NCAA regionals the second weekend of the tournament, so being in the top four is huge. The top 16 seeds host the first and second rounds. BYU’s chances suffered a big blow last week when outside hitter McKenna Miller tore her ACL in the win over Santa Clara. The junior nicknamed “MC Hammer” was second on the team to Jones-Perry in kills, with 250. The Cougars responded by hitting .537 in the win over San Francisco, BYU’s second-highest percentage in the rally-scoring era. “This team is resilient. They are competitive. They are gritty. They have a lot of heart. They play with a lot of emotion. They are fun to watch. They work really hard. They are high character young women on and off the court. They are smart. They just love volleyball and they love each other and they want to see how far this group can go,” Olmstead said. 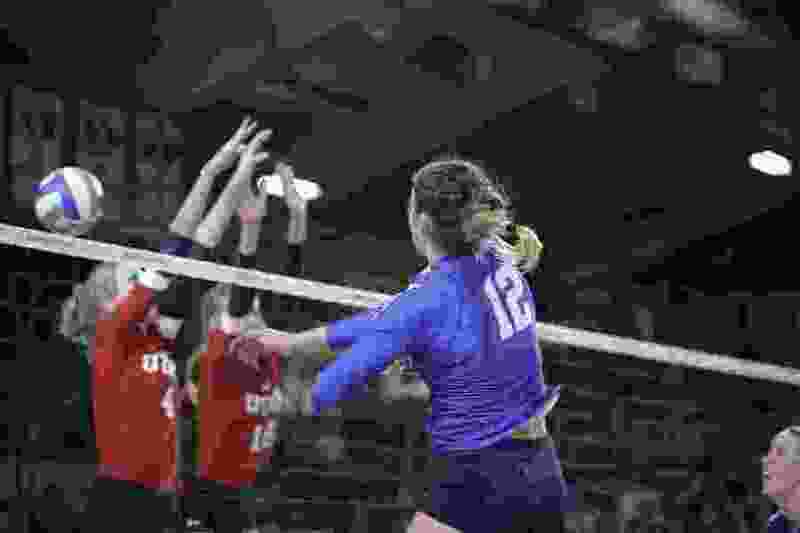 As ESPNw pointed out Monday, no team coached by a woman has won a Division I volleyball national championship, so Olmstead could make history if the Cougars keep rolling. But the coach who took over the program from her brother, Shawn, after BYU reached the national championship game in 2014 isn’t interested in talking about possibilities. Her team’s focus remains on the next match, which happens to be at Saint Mary’s on Thursday. Since losing to Penn State in the 2014 finals, BYU has been eliminated in the Sweet 16 round of the NCAA tournament the last three years. Seniors Jones-Perry, Lacy Haddock, Lyndie Haddock-Eppich, Sydnie Martindale and Danelle Stetler were honored Saturday before the sweep of the Dons. Jones-Perry, a West Jordan native who has posted 1,307 kills in a brilliant four-year career, said this is the most selfless team she has ever been on.